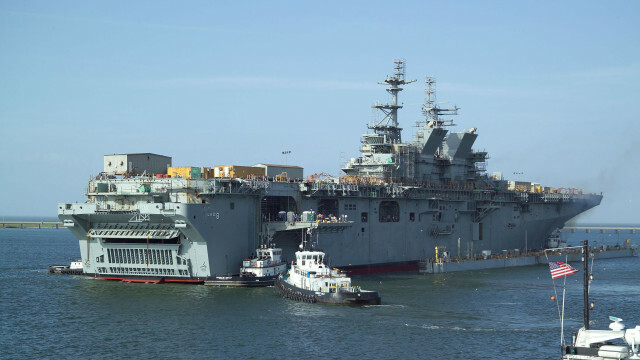 A search-and-rescue operation was underway Wednesday in the Arabian Gulf for an airman whose aircraft lost power while taking off from the San Diego-based amphibious assault ship USS Makin Island. According to the U.S. Fifth Fleet, two crew members of a U.S. Marine Corps MV-22 Osprey bailed out when the aircraft had trouble. One was rescued but the other is missing. The pilot was able to regain control of the aircraft and land safely, according to the Navy. The rescued crew member was reported to be in stable condition. The Makin Island left San Diego July 25 with elements of the 11th Marine Expeditionary Unit aboard. The cause of the power loss was being investigated.